We want your business to join our growing list of contractors and professionals represented on our website! The majority of a contractor’s future clients and our retail customers, will search the web first when looking for a qualified contractor. If you are not listed on the internet they will have a hard time finding you and will usually go with a contractor that utilizes the web for proper advertisement. Building a web presence is beyond the skill and resources of most of us. This is where we want to help. The support of our account holders is paramount in our relationship and we think this assistance is a great way for us to prove it. We know that our contractor clients are the best that the Olympic Peninsula has to offer and your success is our success. 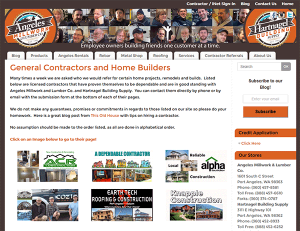 We want you, as an account holder, to be a part of our contractor referral page for the community to resource for all their building, remodeling and home maintenance needs. Whether you do $2000 a year with us or $200,000, our end goal is to offer a complete resource of dependable, quality contractors. But we can’t do it without your involvement. 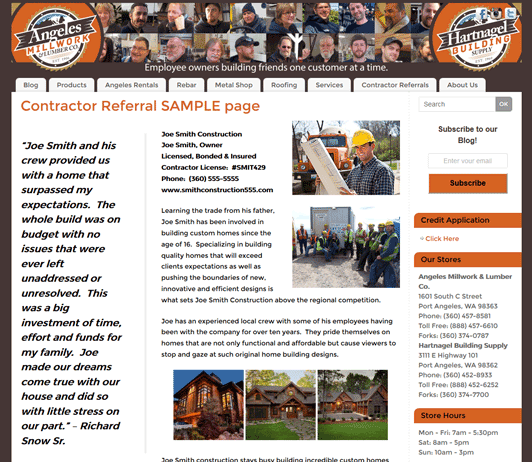 Our retail staff are asked daily for recommendations on different installs, projects and builds so we decided to create a section on our web page called “Contractor Referrals” where we can direct our community and homeowner customers to your personalized web page. Check it out by clicking HERE. This service is of ZERO cost to our account holders. We welcome general contractors but we are also searching to fill areas for specialized contractors in painting, plumbing. electrical, fencing, landscaping, concrete, and cleaning. A personalized web page on our website in our Contractor Referrals section under the heading of your expertise that will include the following. A customized page header with your logo and images. Images of the owner and crew. A customer statement of satisfaction of past work completed. A full submission form that potential customers can fill out desired work to be done and contact information that once filled out is emailed directly to you. The ability to change the web page at any time utilizing our staff. Some concerns with many of you is that web pages seem complicated. No worries. We can build your web page with just a small amount of time from you. Our advertising coordinator would need approximately 30 minutes of your time to get the necessary info to fully build out your web page. The only requirement we have for you to participate is that you MUST ALWAYS be licensed, bonded and insured. This will be checked on a regular basis. It is imperative that for us to provide a resource such as this, that our customers trust who we are recommending. We will do a short consultation over the phone or in person at Hartnagel Building Supply and need the following information. Photo of the company’s owner and crew (if applicable). Short bio on the owner (hobbies, life away from work). Photo(s) of completed work (prefer at least two but the more the merrier). Short bio on the company. Our retail staff will recommend these pages to inquiring customers. Throughout the year we will feature completed web pages on our Facebook page advertising them and their services to thousands of potential clients on the Olympic Peninsula. We continually scour local Facebook pages for home owner inquiries of whom in the area people would recommend for specific jobs. We will post links to these posts with the pages that fit their desired job question. Your page can be modified and updated as you see fit. If you have new pictures of completed jobs, contact us and we’ll update your page with them to keep it new and relevant. We will show you how to link and advertise your new page on the web. Whether it be your personal Social media page, a Facebook post, in an email or featured on a business card, we are here to help. Pick Up Your Registration Forms for the KONP Easter Egg Hunt!